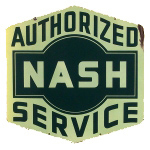 This service station sign advertises the Nash Brand. The sign has a peaked top and bottom. The keyhole-shape of the Nash logo appears in the center. On the top and bottom are the words “Authorized Service.” The sign is white with green text.